This was taken from a plane landing at Ft Myers, southern Florida. the boats scurrying around the bridge were almost hyonotic. Hey Selvin. From the looks of it you made the rounds in South Fl.... Ft. Myers to South Beach. This is a state with a lot of geographical diversity. 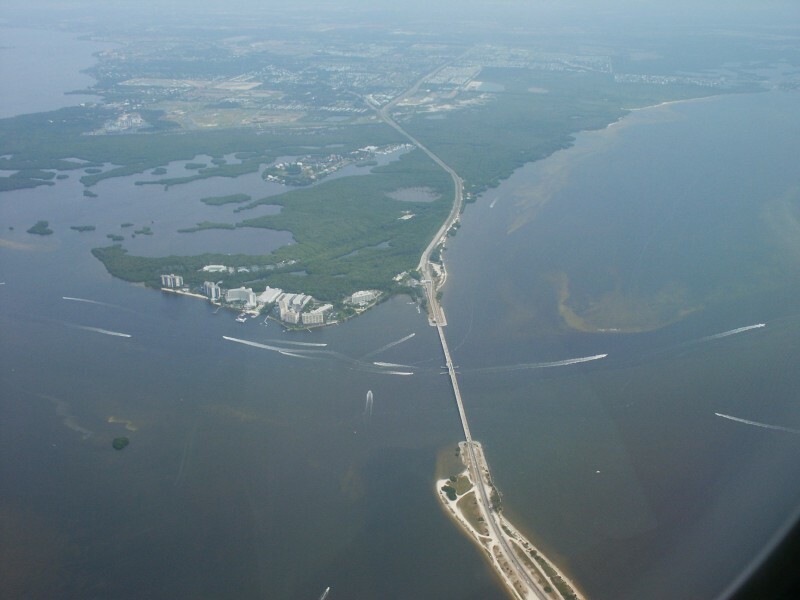 Beaches on the outer edges, Everglades in the middle, and some interesting and historical small towns throughout the state. Hopefully you enjoyed and weren't introduced conversely to our infamous crime problem! Thanks for the post shot sample. I didn't have any filters at the time. How were you able to produce the PS results? Been going to South FL for several years. Haven't been a victim yet -- knock on wood. You are correct the state is quite diverse. Not sure if you actually visited my web site on South FL. In case you haven't. How were you able to produce the PS results? Auto levels. Then a dose of defogging with unsharp mask set to radius about 190 and amount to about 17. Some tweaking in curves and selective color and a real sharpening with the radius about 1.5 and the amount somewhere around 30 if I remember correctly. Highpass filter might have been good also but I didn’t try it. Nice picture. I actually like the original better than the "beefed up" photoshopped version. The editing brought out a lot of noise that wasn't visible in the original image. If you are referring to the water it actually looks that way from the air in the winter when the water is clear. One of the big complaints is big boats damaging the bottom growth with their prop wash – you can see some of the results where a big twin prop went through the growth and left sand. It is actually good for fishing as predators hide along the edges to pounce on anything in the tracks. One of the big hints for Florida fishing is to go out in the winter and find places that might be good for fishing when the weather warms up. In the summer the water gets cloudy and you can’t see the bottom features as well. And the water is a little more green instead of dark blue. Thanks for the information on the post shot op.